“To be awarded the certificate at such an event as the BHS International Convention was a wonderful reminder about what an achievement this is and that it is such a highly respected award! It is a very special reminder about how far I have come and what I have achieved so far, thanks to the help of so many, since my stage 1 exam 11 years ago!” Says Liza. At just 25, Liza is one of the youngest equestrian professionals to achieve this well-regarded accreditation. The Stage 5 is a gruelling course which requires the coach to demonstrate proven ability across all three Olympic disciplines, creating a pathway to teach and train horses to British Dressage Advanced Medium, British Showjumping Foxhunter and British Eventing Intermediate. In addition to riding and coaching at this senior level, Liza was also required to demonstrate a broad knowledge of all aspects of business management and stable management, which includes horse health, care of competition horses and breeding and management of young horses. Liza has been teaching since the age of 16, and at Collective Equestrian from the beginning, over two and a half years ago. 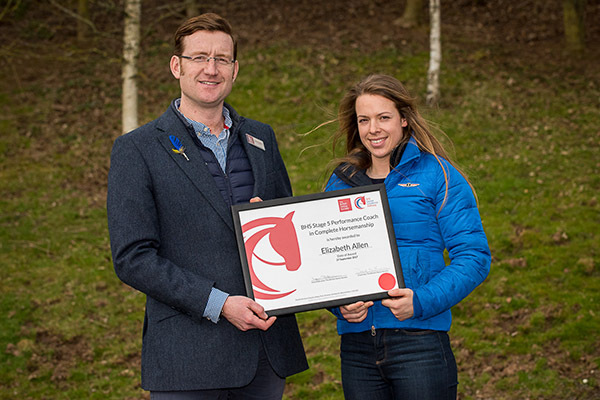 As per the original ethos behind the Collective brand, Liza is increasingly involved in delivering stable management training to other equestrian professionals coming up through the ranks – in addition to helping clients expand their personal knowledge of the current best equestrian practice in terms of horse care. Not one to rest on her laurels, Liza has already got her sights set on two further challenges, to become a Fellow of the BHS, as well as a British Dressage Accredited Judge. Watch this space!